You’d think it would be simple, but Tivoli’s Omegamon XE monitoring products are anything but. As you work through the Omegamon maze you will see names like Omegamon XE, Omegamon DE, Omegamon II and Omegamon Classic. Even the displays can be different: CUA, Classic or TEP. Not to mention Omegamon agents and the Omegamon Management console. So you can be forgiven for being confused about Omegamon. This month, we provide the definitive five minute guide to Tivoli Omegamon XE. In 1975, Aubrey Chernick began developing a product to monitor MVS. He saw that MVS had nothing to show a clear picture of performance, or to easily determine performance problems. In some cases MVS also missed tools that were very handy when administering MVS systems. His solution: Omegamon. His company, Candle Corporation became one of the largest providers of performance measurement software for the mainframe. By the time Candle was acquired by IBM in 2004, it had 3000 customers in 50 countries, including 83% of the Fortune 100. Omegamon was accessed from a 3270 screen – logged on from a VTAM application, accessed from ISPF or displayed continuously from a dedicated VTAM terminal. It provided screens to quickly see MVS performance and problems, like the one below. Omegamon quickly became a favourite of Systems Programmers around the world. Omegamon provided screens that would clearly show any potential problems, like the Omegamon for CICS screen above. Application and task performance could be seen, and basic performance metrics analysed. But Omegamon went further than that. It provided a raft of tools to allow Systems Programmers do anything from modifying memory to dynamically adding SVC routines. Omegamon also provided an Application Tracing Facility (ATF) for tracing problem tasks. Omegamon wasn’t limited to MVS. After the success of its original Omegamon, Candle released monitors for IMS (Omegamon/IMS), CICS (Omegamon/CICS) and DB2 (Omegamon/DB2). Today, Omegamon Classic can still be found in Omegamon XE for z/OS, IMS, CICS and DB2. As Omegamon matured, Candle released other products to enhance its original Omegamon family, products that are all included in today’s Omegamon XE. 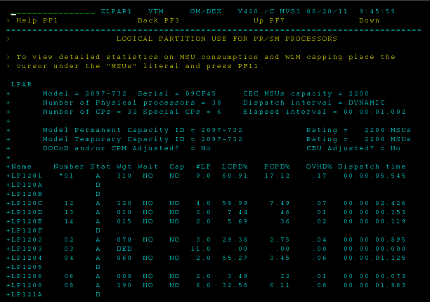 Dexan is a z/OS bottleneck analysis tool similar to RMF Monitor III. Point it at an address space, and it will show why that address space is waiting, and other address spaces impacting it. It regularly samples the address space, searching for delays like I/O, enqueue, tape mounts, paging, swapping, JES, HSM or CPU. DEXAN/IMS does something similar for IMS workloads. The Response Time Analyzer (RTA) breaks down the response time of workloads into individual components in real-time. From these screens, programmers can target the component slowing things down, and work to fix it. RTA is available for z/OS (RTA/MVS), CICS (RTA/CICS) and IMS (RTA/IMS). EPILOG is the historical part of it all. It can store the information collected by Omegamon, DEXAN and RTA, and save it for later. The data can be analysed from batch or an ISPF interface. The Omegamon End-to-End product (ETE) showed the application response time as seen by a VTAM end-user, including processing and network times. Omegamon II still needed the classic Omegamon: in reality it was only a new face for Omegamon Classic. Omegamon II actually issued Omegamon Class commands under the covers. You can see these commands by following IBM Technote 1222528. Omegamon II also provided a gateway to the classic Omegamon interface for those preferring it. Originally sold as a separate product, Omegamon II was eventually packaged together with the classic Omegamon as Omegamon II. Today, Omegamon II is also included in Omegamon XE. New Omegamon products introduced by Candle in the 1990s were only released with the CUA interface – no Classic option. This is why products such as Omegamon XE for Mainframe Networks and Omegamon XE for Storage don’t have a Classic interface. 3270 screens are fine, but by 2000 Windows and Graphic User Interfaces were all the rage. In 2001 Candle announced Omegamon XE (Extended Edition): a Java interface for all of its Omegamon products. Omegamon XE used a local IRA (Intelligent Remote Agent) or OMA (Omegamon Monitoring Agent) on z/OS to send information back to a central server called the Candle Management Server (CMS). The CMS would process this information, and hold it ready. The Candle Net Portal Server (CNPS) performed the central processing to allow users to display this information, and Candle Net Portal clients (either a Java client program or web-browser interface) showed this to users. At the same time Omegamon DE (Dashboard Edition) was also announced. Omegamon DE allowed information from multiple Omegamon monitors, as well as other sources, to be seen and processed together in a single view. Today, this is all included in IBM Tivoli Monitoring. The CMS is now TEMS, the CNPS now TEPS and the Candle Net Portal client TEP. Omegamon XE TEP screens today look like the Omegamon XE for Websphere MQ screen below. You can find out more about ITM in our article The Basics About ITM. This can cause some confusion. Omegamon XE is sometimes used to refer to the Omegamon agent that communicates with ITM, and sometimes to all Omegamons: Omegamon XE, Omegamon II and Omegamon Classic. To make things worse, not all Omegamon XE products include an Omegamon Classic or Omegamon II component. Some Omegamon products such as Omegamon XE for Networks and Omegamon XE for Storage only have an Omegamon II component Even more recent products such as Omegamon XE for Messaging and Omegamon XE for Websphere Application Server have no Omegamon Classic or Omegamon II component – just the Omegamon XE agent. Some Omegamon XE products amalgamate traditional Candle products with existing IBM products. For example, Omegamon XE for Mainframe Networks includes Candle’s Omegamon for Mainframe Networks and IBMs Tivoli Monitoring for Network Performance. Omegamon Classic and Omegamon II don’t need ITM or an Omegamon XE agent to run. Users can still logon to the 3270 applications like they always have. However Omegamon XE agents usually use Omegamon Classic and Omegamon II. For example, Omegamon XE for CICS, IMS and z/OS all need their respective Omegamon II and Omegamon Classic processes running. 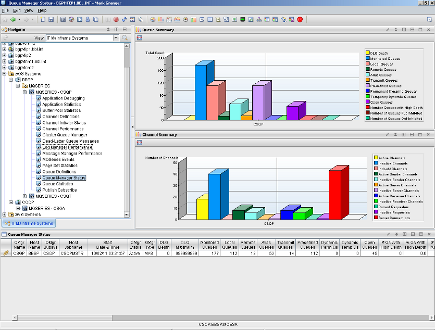 The Omegamon XE Management Console (OMC) is a free, cut-down version of Omegamon XE for z/OS. 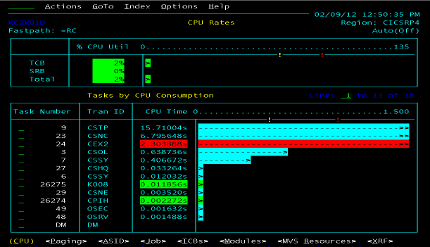 On z/OS, OMC runs as an Omegamon XE monitoring agent, and has a local hub TEMS running alongside. On the PC side, it has the usual TEPS framework running on a PC. OMC doesn’t use Omegamon Classic or Omegamon II – the Omegamon agent is all it needs. OMC doesn’t provide a lot of monitoring options – it has around 10% of the full Omegamon XE functions, predominantly Sysplex oriented. It also provides a GUI front-end to the IBM Health Checker. OMC could be seen as a free sampler for Omegamon XE for z/OS. For z/OS, DB2, CICS and IMS; Omegamon XE is really three separate products: Omegamon Classic for the basic functionality, Omegamon II for more sophisticated 3270 screens, and Omegamon XE for the monitoring agent and tasks that work with ITM for GUI access. More recent Omegamon products do not have a Class component, or even an Omegamon II component in some cases. Omegamon Classic and Omegamon II do not need the ITM infrastructure or extra monitoring agents. However the Omegamon XE agents usually need their corresponding Omegamon Classic and Omegamon II tasks.